Traditionally, multiple scenarios of a model would be handled by saving the entire project as a new file. This makes it difficult to keep track of various versions of the model and which inputs lead to specific results, etc. In Visual MODFLOW Flex, a numerical model run can be duplicated or 'cloned' and managed and modified in a single project. This facilitates an iterative approach to modeling by allowing you to adjust a few input parameters, translate and run, and interpret the results. You can also Compare Heads or Drawdown between model runs to other scenarios. To Clone a numerical model, follow the steps below. After this the model tree will be duplicated and added under the selected numerical grid; a new Numerical Model workflow will then load where you can work with this model run clone. The Workflow and Model Explorer are closely associated; as you progress through a specific numerical model workflow, the items you see in the Flex Viewer originate from the corresponding Run folder on the Model Explorer. 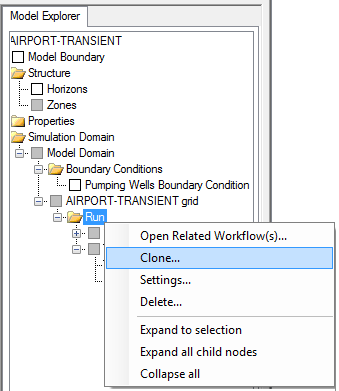 For example, if you are working a clone of a model run, eg. 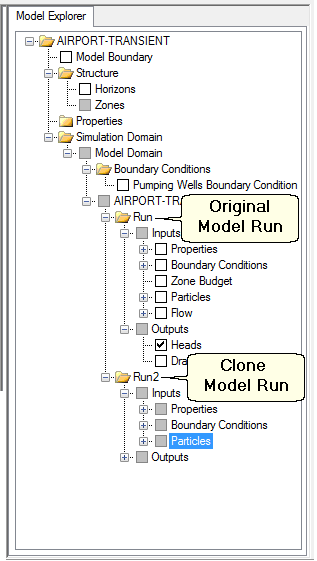 Run2, and you are viewing boundary condition cells, you will see these originate from the After this the model tree will be duplicated and added under the selected numerical grid; a new Numerical Model workflow will then load where you can work with this model run clone.